One of the best things about wrapping up the madness of selling the house and clearing everything out is the ability to spend some downtime doing what we want without the guilt of putting important tasks off. So today, that meant Mountain Biking! 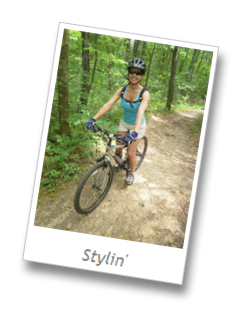 One of the Michigan Meetup groups has done some hiking at the Potawatomi Trail at the Pinckney State Recreation Area, and Colette thought it would be a great trail to mountain bike. 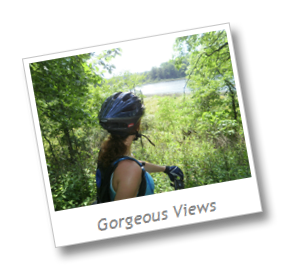 Apparently it’s considered the best place in Lower Michigan, and is a mecca for mountain bikers. The main trail is 17+ miles. Crap. All is not lost though – there are two shorter trails, so we decided to hit the Silver Lake Trail and the Crooked Lake Trail. Interesting, since my Michigan house is (was!) on Crooked Lake, and is right next to Silver Lake. Not the same two, but an interesting twist nonetheless. We’re both in pretty good shape, but wow. Just wow. And we took the easy loops! Long rutted uphills filled with boulders the size of Volkswagens, downhills with the same boulders and sandpits roughly the size of the La Brea Tar Pits, and everything in-between. Judging by some of the huffin’n’puffin, we need to spend a lot more time on the trails to get ourselves into practice. I put a new front fork on Colette’s Trek 3500 yesterday with some suspension to replace her old rigid fork, and her wrists are thanking me today! Next up is a seat post with a built-in shock to dampen some of the jarring from the hardtail rear, and she’ll be riding circles around me.